The U.S. Has More Guns, But Russia Has More Murders : Parallels A prominent Russian lawmaker mocked the U.S. during the mass shooting in Washington this week. But statistics show that Russia has more killings each year than the U.S. despite a much smaller population. 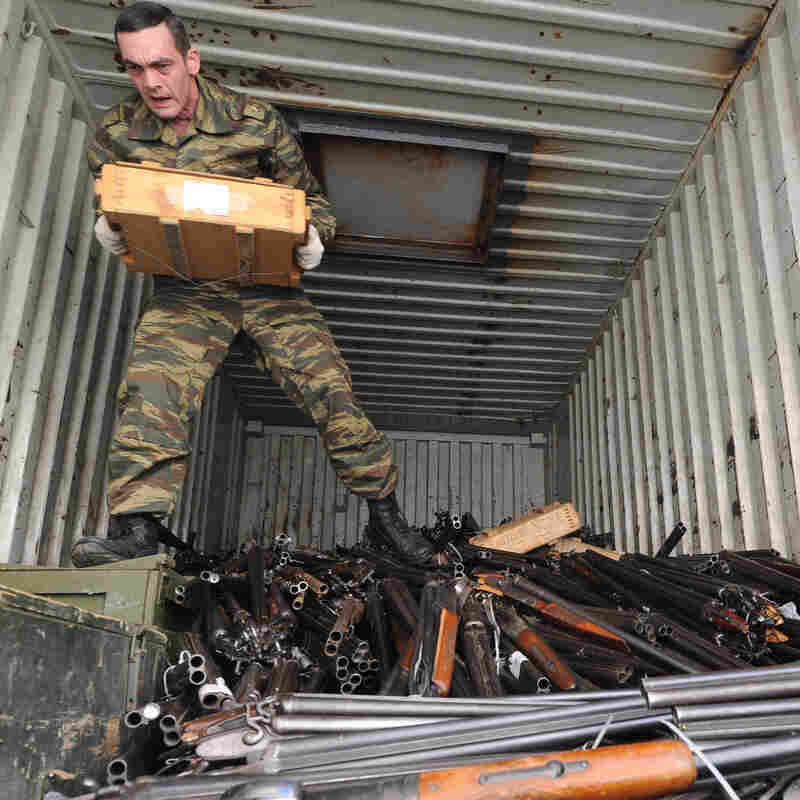 A Russian police officer unloads guns seized from the public that are to be melted down in the Rostov-On-Don region on May 28. Russia has strict gun laws and far fewer guns in circulation than the U.S., but Russia has a much higher murder rate. The U.S. and Russia have been taking lots of jabs at each other. Russian President Vladimir Putin criticized President Obama's plan for a military strike in Syria, and the Russian leader then denounced American "exceptionalism" in a biting op-ed in The New York Times. Sen. John McCain, R-Ariz., fired back Thursday with his own op-ed in the Russian paper Pravda, entitled, "Russia Deserves Better Than Putin." Even Monday's shooting at the Navy Yard in Washington, in which a gunmen killed 12 people, has become part of the feud. Alexei Pushkov, the chairman of the Foreign Affairs Committee in Russia's parliament, used the shooting to mock the United States as it was happening. "A new shootout at Navy headquarters in Washington — a lone gunman and seven corpses. Nobody's even surprised anymore. A clear confirmation of American exceptionalism," Puskoy tweeted. Новая стрельба у штаба ВМС в Вашингтоне - одинокий стрелок и 7 трупов. Никто уже не удивлен. Наглядное подтверждение "амер.исключительности"
But while Pushkov sneers at U.S. gun laws, how do the stats look in Russia? According to Gunpolicy.org, Russians have far fewer guns than Americans — and far more homicides. There are fewer than 13 million firearms in circulation in Russia, compared with an estimated 300 million in the United States. That works out to about 9 guns per 100 people in Russia and closed to 100 guns per 100 people in America. The most recent homicide statistics for Russia show that there were 21,603 killings in 2009. 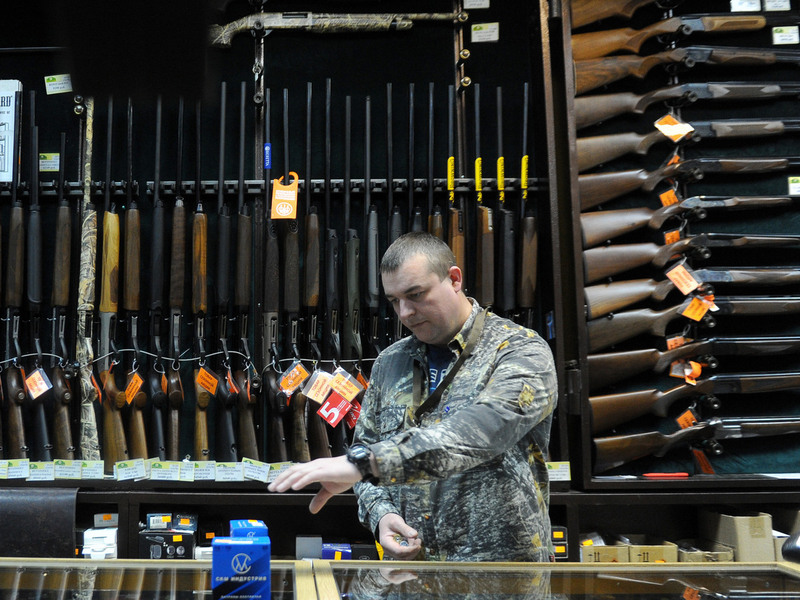 A worker at the Grand Okhota sportsman gun shop in Moscow on April 23. According to the FBI, the United States had 13,636 homicides in 2009 with a population that is more than twice as large. More than 80 percent of those killings were gun-related. It's difficult to make a direct comparison of gun homicides in the two countries because Russia doesn't break down its murder statistics. Russia has tough gun laws on the books. It's illegal for Russian citizens to own automatic and semi-automatic guns. It's possible to apply for a handgun or shotgun license, though citizens are required to provide reasons such as hunting or target shooting. Applicants face strict background checks, including criminal history, a full psychological evaluation and a medical exam. They must pass a test on firearm laws and safety. Each weapon is then registered by the police during a home visit. Police take bullet patterns, test bullets and cartridges so bullets can be matched if the gun is used in a crime. A license lasts five years, after which applicants must go through the whole process again. In spite of these laws, the country does have periodic mass shootings by people thought to be mentally ill.
Last November, after a five-day drinking binge, 30-year-old lawyer Dmitry Vinogradov posted a message online referring to humanity as "compost." Shortly after, he walked into the Moscow pharmaceutical company where he worked and opened fire, killing six colleagues and critically injuring another. He was jailed for life last week. The Right to Bear Arms, a Moscow-based organization that has more than 5,000 members, is trying to make guns more easily available in Russia. "Our citizens are deprived of normal tools of self-defense, and that plays an important role in public safety," Maria Butina, the group's 24-year-old founder, told The Moscow News. But she has a long way to go in convincing the public. A poll by the Levada Center in 2011 showed that 80 percent of Russians are opposed to easing existing gun laws.